A long time ago, I played with Povray. Now, with a recent revamp of my website, I’ve decided to take another poke at playing with it. I’ll post my work here in the Povray category as I progress. 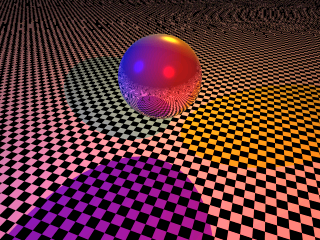 A reflective sphere over a checkerboard sphere. I liked the look of the colored shadows — the mixing of the primary colors in each of the shadows resulted in the purple/orange/green shadows, even though the light sources are all primary colors. The sphere is white, with a high phong value (sheen) and relatively high reflectivity. You are currently browsing the archives for the Povray category.